My career as a veterinarian began in 1998 when I graduated with my doctorate from the University of Pennsylvania School of Veterinary Medicine. I then completed a one-year rotating internship in small animal medicine and surgery at the Oradell Animal Hospital. I continued on at Oradell as a staff doctor for ten years. This privilege enabled me to expand and hone my medical and surgical skills working alongside some of the finest veterinary specialists in the field. My commitment to Low-Stress Handling and the Fear-Free philosophy was inspired, in part, by a handsome, bay Quarter Horse named Freckles. He came into my life in May 2008. As a former professional horse trainer, I have always had a keen interest in animal behavior and training strategies. After the first few months that Freckles was with me, I grew to realize that he suffered from a shattered spirit. I was to learn that his previous owner had trained him in a very forceful way. The harsh methods used left emotional and physical scars. Freckles was extremely fearful, and at times, explosive and angry—towards other horses and humans. 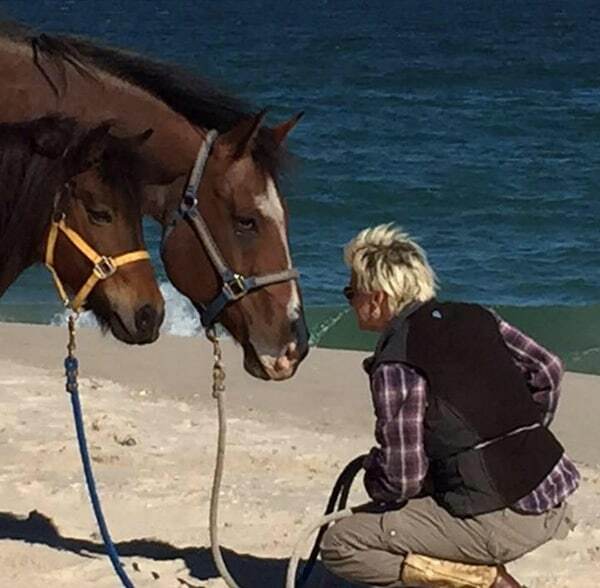 I was determined to help this horse and would not give up on him. After researching many different methodologies, I made a commitment to provide Freckles with only a positive-reinforcement approach. Over time, Freckles rediscovered his curiosity and self-confidence. Now, he is always the first horse to greet visitors. He has even made himself available for wedding photos, Brownie troop tours, and introducing puppies to horses. This experience was personally gratifying and awakened me to the potential of what was possible by being patient, observant and use positive-reinforcement at all times. Inspired by my increased interest and commitment to behavior science – particularly with its applications to veterinary medicine—I decided to pursue additional education to refine my training. Completion of advanced courses in behavioral medicine with Dr. Karen Overall, V.D.M, PhD. Completion of the course “Living and Learning with Animals” with Dr. Susan Friedman, PhD. Graduation from the Karen Pryor Academy – achieving Dog Trainer Professional status. I am very proud that Pets Aloud Veterinary, as a practice, has achieved Silver Certification in Low Stress Handling ™ Techniques. My latest personal achievement is being certified as a Fear Free Professional, and my next goal is to pursue Fear Free certification for the hospital as a whole. Some of my other interests include surgery and pain management, including acupuncture. Outside of the veterinary office, I also enjoy equine activities, skiing, mountain biking, and of course, family time. …with a foundation based in kindness, caring, and high-quality medicine.